I don't think that there's any denying that we live in the drone age. Just ask TIME, whose latest cover is dedicated to that very subject. From our point of view as photographers, drones have opened up new worlds of possibilities by allowing us to take our cameras to the skies. Editor's Tip: Your best photos deserve a place on your wall. Learn how to turn your photos into fine art. 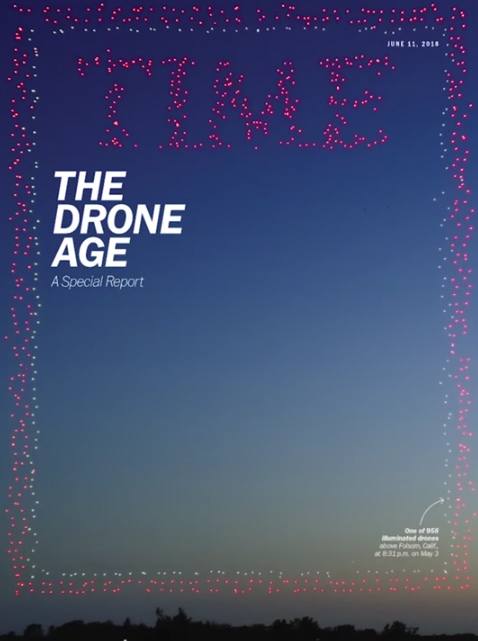 But the TIME feature is much more than a retrospective on how drones have changed the world of photography. Instead, it's an examination of how drones have impacted the very fabric of our culture, from the use of drones in war to the use of drones to protect endangered species and just about everything in between. The report is an interesting read, for sure, and makes you realize just how rapidly drones have become such a ubiquitous part of our lives. But perhaps the most impressive thing about the TIME feature is the cover of the June 11, 2018 edition. 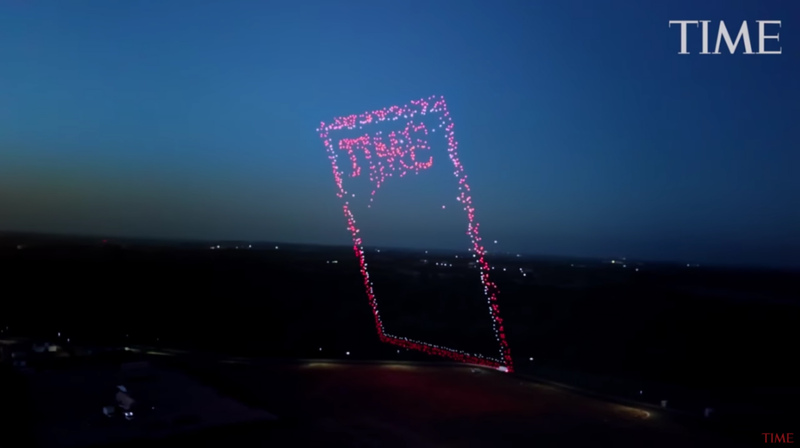 Using 958 drones, the Intel Drone Light Show team recreated the magazine's red logo and red border. 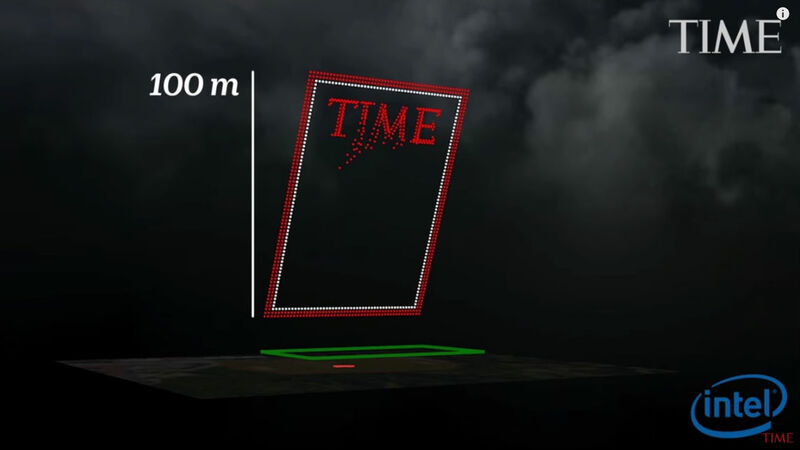 The display - one of the largest drone shows in American history - measured a whopping 100 meters tall. Considering that the flight ceiling for the drones was 400 feet, there wasn't a lot of room left over once the 100 meter (approximately 328 feet) display was live. The display, which was created in partnership with Astraeus Aerial Cinema Systems, was created in the skies above Folsom, California, where an Intel campus resides. In the behind-the-scenes video above, you can see how the impressive drone swarm was filmed with a cinema camera mounted on a drone flown by the Astraeus team. What I found so astonishing is that each of the 968 drones had just 1.5 meters between it and its neighbor. A strong gust of wind could have easily pushed one drone into another, creating catastrophe. The still photo that adorns the June 1 issue of TIME is a single frame that was extracted from the Astraeus footage, and is the first TIME cover photo to be taken via drone. But it also demonstrates how far drone technology has come and how much this technology has shaped our world - and will continue to do so in the future.